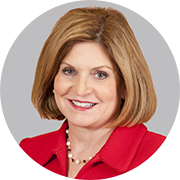 Ann Madden Rice is the president of Abbott Northwestern Hospital and senior vice president, Allina Health Operations. Rice came to Allina Health in October 2018 from the University of California, Davis, Medical Center in Sacramento, Calif., where she was chief executive officer. She previously served as CFO and CEO for the University of Iowa Hospitals and Clinics. Rice has a bachelor’s degree in industrial administration from Iowa State University and a master’s degree in accounting from the University of Iowa. Recognition for Rice has included being named Humanitarian of the Year by the United Cerebral Palsy of Sacramento and Northern California, being recognized as one of Becker’s Hospital Review’s “Women Hospital and Health System Leaders to Know,” and being honored by numerous organizations and publications in California and Iowa. Her accountabilities include enhancing Abbott Northwestern’s legacy of excellence, building a multiyear master plan for Abbott Northwestern, and ensuring Abbott Northwestern is positioned to deliver Whole Person Care. She also works to ensure achievement of Allina Health’s systemwide performance goals and strategic plan, and serves on Allina Health’s executive team, ensuring collaboration and improvement across Allina Health.